Osborne Delta provide a full surge protection package from survey, through to installation, in line with all the requirements in BS 7671 and BS EN 62305-4 for any project. 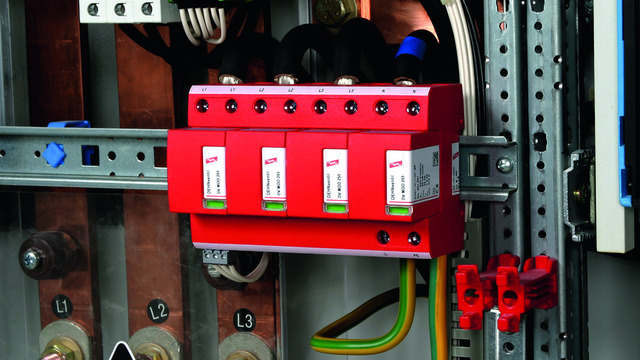 We use Dehn surge protection products which are all tested to and comply with EN61643-11 the surge protection standard for the UK. Direct lightning strikes to a structure. (L.E.M.P.) lightning electromagnetic pulse. Indirect lightning strikes to a service line going into a structure. Surges within the electric system of a structure. (S.E.M.P.) switching electromagnetic pulse. Osborne Delta can supply a range of products that are able to protect power supplies or equipment you may require, no matter how specialist. Prevent dangerous sparking, a major cause of fire therefore preserving life. Prevent major damage to circuits and expensive equipment. Prevent damage to sensitive/lifesaving equipment. Prevent long periods of non-productive ‘down’ time whilst waiting for lengthy repairs to damaged systems and equipment. Extend the life span of your expensive sensitive equipment. If you wish to find out more information, get in touch.